If you’re someone who has a roofing repair or construction project on a minimally sloped roof, then you should be using CMI’s Skyrail system. This system helps for whatever your roofing project might be and is more beneficial toward your project than any other method out there. First off, this roof sheet moving system improves roof sheet productivity. Normal roof repair and construction requires a lot of time to move equipment along the roofline. 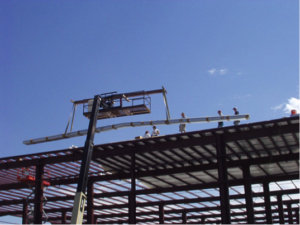 Typically construction crews rely on manpower to keep the materials distributed to the leading edge instead of having them work on installing the roof with the rest of the crew. This makes the roofing project take longer than necessary. With the Skyrail system, these crews no longer have to waste time and manpower on people carrying and distributing roof sheets themselves because they now have a set of trolleys and rails that holds the materials and moves with them along the roof. Each trolley is capable of holding up to 1,000 lbs. of materials. It’s also an easy to use and cost-effective option. Don’t think you’re wasting your money in purchasing this system because it will almost pay for itself in labor savings within the first few uses. The Skyrail roof sheet moving system, will cut any installation time in half. Here at CMI, we put the customer’s needs first, which is why our products are made to benefit each and every one of our customers and their projects. Contact us today to see how our Skyrail system can help with your roofing project or to receive your free quote.